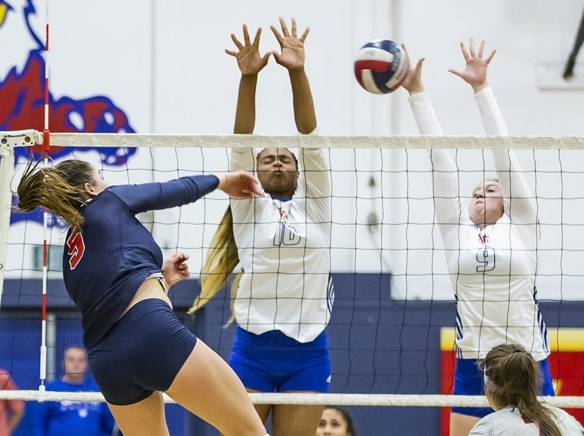 The Los Alamitos High girls volleyball team continues its trek through the CIF State Championships, after knocking off Scripps Ranch, 25-21, 25-22, 25-17 in the second round on Thursday. Scripps Ranch was the No. 3 seed in the bracket. Starr Williams had 16 kills and Abby Karich added 11. Alexandria Livingston had 36 assists and also a team-leading four ace serves. Jacinda Ramirez had 18 digs and Abby Blasi contributed eight digs. The Griffins will play at second-seeded Foothill High on Saturday at 6 p.m. The Knights knocked off Aliso Niguel in their second-round match.